Around these parts, the beginning of September means not just the return of fall but the return of the Kitchener-Waterloo Knitter’s Fair! A whole bunch of fantastic vendors from Ontario and beyond are out in full force to support the knitting needs of the thousand or two knitters who drop by for the day, and it was once again a pretty great time yesterday. I went with my mother and sister and we each did pretty nicely. My haul was a bit more modest than in past years, but I did come away with enough Manos worsted to knit a sweater, which I’ll hopefully pull out before too long and put into action for my Rhinebeck sweater knitting. It’s too delicious to let sit in the stash! I think I ran into almost every knitter I know. (Almost). But since I know there were a few knitters from far and wide not there, I’ve got a super snazzy treat for you in the form of a blog giveaway! 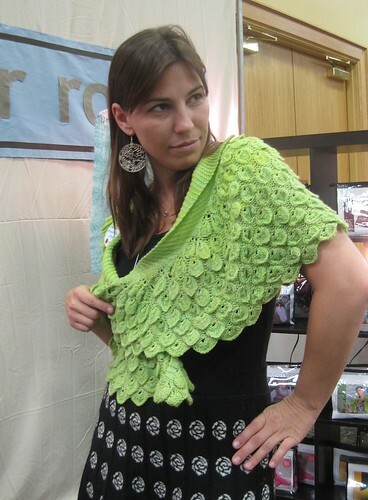 It’s been a while since I’ve done one of these, and thanks to the super generous folks at Van Der Rock Yarns, one of you could be the proud owner of a kit (pattern and yarn) for this fun and retro Winged Nike Capelet. The kit I’ve got to give away is in the pale pink Bismuth colourway, although Stephanie was wearing hers yesterday in the bright green Gypsum shade and it was pretty great. It’s really quite an inventive knit. It uses a double strand of laceweight and has an interesting feathered look to it, thanks to Stephanie’s ingenuity in trying to recreate in knitting a similar stitch she’d seen done in crochet. I appreciate that kind of knitterly geekery, man, I really do. It has a sort of comfortable retro look to it. To enter to win, just leave a comment on this post, telling me what excites you the most about knitting! I’ll draw a winner by noon (my time) on Tuesday this week. And happy knitting as always! Have a great Sunday. What I like about knitting is that it brings together people from all walks of life. What a nice giveaway! I am not entering because there’s no way that I would be able to make it but it is beautiful. It’s exciting to me that I can create something where there was nothing, with just some yarn and needles. I like the magic of what different stitches can do, like turning a heel on a sock. I like that I can wear socks that I made myself! Sounds like a great time! What excites me the most about knitting is that it produces a substantial, tangible (not to mention cozy) result. Every time you blog about knitting fairs and conventions and the like, I am entirely jealous because there are none of those close to where I live. Sad. What excites me most about knitting is sweaters. Wrap front, cardigan, vest, pullover… I love sweaters. And there are so many varied patterns! And so many designs! I wish to knit them all. I love seeing the pieces transform from just rows of knitting into a gorgeous object. Fun!!! I agree with bsveum above. Nothing near me except for the annual MD Sheep and Wool. The most exciting thing about knitting for me is that I can pick my own designs and colors, and if there is something I want and it doesn’t seem to exist, I can figure out how to make it. And I like that it is a portable activity that produces things I can share with others! I have just returned to knitting after a 20 year absence & what excites me is the wonderful fibres that are now available. I love the different textures that you can create. What a fantastic wrap! I love the pattern, the color…everything! I broke my wrist kickboxing back in the beginning of July and have been in a cast since then.. the pins are coming out of my wrist next Friday and my first question to the surgeon will be “WHEN CAN I KNIT?? ?” I have been cruising Ravelry, torturing myself for weeks wondering what I will knit first. Fact is I have baby stuff to do that I was midway through that I have to complete.. but then.. I’m just so excited to start knitting again!! I love having something useful to do with my hands while I’m watching TV, waiting in line, etc. I’m also mostly a product knitter, so I really like having the finished objects too. I like getting lost in my knitting, calming down and blocking out the world. And all yhe wonderful knitters I know, probably the best part of my social life. The things that excite me about knitting are many: having something concrete to show for my efforts, having things that fit me well among them. But without the community I have built, I don’t think knitting would mean nearly as much to me. Right now I’m excited for fall sweater knitting! Best time of the year for us wool-lovers. I love that I can actually CREATE something when I knit. It’s relaxing and at the end I have a tangible product that I can say I made! What I love about knitting is that allows for unlimited do-vers. Would that life were like that. I am a new knitter and what I like is all of the variety and yummy yarns out there. It just never ends. I would love to win this contest and aspire to learn the stitches required to make this. What a challenge. Awesome! What excites me most are the endless possibilities and variables! 10 people can work from the same pattern and modify to create 10 totally unique finished pieces. It is inspiring and keeps me motivated. I agree with bsveum. After reading your posts I have searched and searched to see if there was some fun yarn or knitting even near me, but sadly no. I love that knitting is relaxing, and that I am creating. I think the creating is my favorite part. I feel like I am making something from next to nothing. 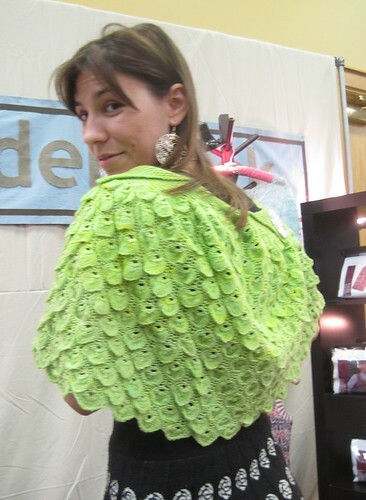 What a clever shawl! So beautiful. I like everything about knitting! But I guess what keeps me stitching is making useful, beautiful things to give and enjoy. Thanks for all your inspiration, instruction, and, of course, the chance to win! Just one thing that excites me about knitting.. that’s hard. So many things! Amongst the best though… I teach knitting to high school students and the best moment is when they all ‘get it’ and they’re all sitting there, in their high-school-coolness, needles clicking away and wondering if they can keep going through lunch and maybe English class… love it. I get excited when I can see my pattern grow as I knit – cables especially, but sometimes lace and colorwork. I become a serious victim of one-more-row-itis and can stay up way too late watching a pattern grow. I did it last night with a mosaic snowflake I’m designing. I love knitting for many reasons. First of all, I can make almost anything out of just a ball of yarn and a pair of needles. I feel clever and smart. It also clears my mind and I can get into a meditative state which is calming and comforting. Knitting has gotten me through grief, trials, sadness and the most tender of moments. Knitting allows me to give warmth and love to my family and friends. Knitting to me is everything. Hi Glenna! What doesn’t excite me about knitting! Colour and more colour. Beautiful patterns and garments. Good friends. I am always excited over all the cool things I can do with a pair of sticks and a bit of string – I think the day that I am no longer in awe is the day I will stop knitting… and I’m thinking that after ten years of knitting, that’s not going to happen any time soon. I waited to come back and comment, because the first never wins! I love going into this season…the first yarny event coming up is Fiber Twist next Sunday. 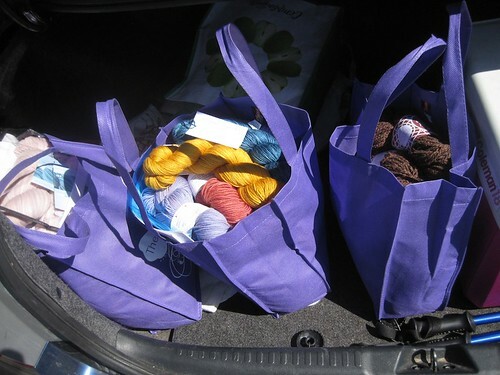 It’s a small local event, but then we have Rhinebeck and Stitches East…woo-hoo! After the apocalypse, we’ll be the only ones with sweaters and socks. The power-trippiness is mind-blowing. Color excites me, patterns excite me, kitting in general excites me. I am amazed that it is possible to take a single strand of yarn and create an entire garment with it. I get excited when I see the incredible things people are doing with knitting these days. The beautiful lace, amazing socks, incredible color work, cables, steeks….the list is endless. If I ever find my knitterly obsession waning, I have only to pop onto any blog and be rejuvenated by hats or gloves or shawls or sweaters (That Neville cardigan has me drooling already!) My knitting geekery knows no bounds and will ever sail to new heights as time goes on! Yep, I love to knit!!! AND we’ll be able to customize three-armed sweaters for all our mutant friends. Oh, yes. Sorry. Knitting is exciting because there’s no limit to what you can make. Knitting is a way to give a part of your creative soul freedom of flight and to share with others the wonder of creative vision. i think the most exciting thing about knitting is how a pattern will surprise you..even if you know all the techniques and you get gauge sometimes it comes out completely different then you expected..and the sense of accomplisment that you feel after finishing a project is amazing! thanks for the giveaway! I love the feathers look! The thing that excites me the most about knitting is the final product. It’s exciting for me to knit and knit and knit something, and when I bind off, I have a project ready for the wearing! I love going places and telling people that I knit this beautiful scarf or hat all by myself. I think what excites me most about knitting is making something from nothing, the same way people have been doing for centuries. It’s a wonderful sense of connectivity, and afterwards, you have something out of it that you can see and touch and *use*. I am hooked on knitting! The thrill of adding each row then laying it out and thinking “wow” look what I’ve done! It’s relaxing, rewarding, and revitalizing! What excites me most is when I reach the half way mark on a project and can see what is to come….then the rush to complete the project and satisfaction of knowing that I was able to create it all by myself! (Of course with a little help from the designers). I love this kit. It does indeed look like crochet. I started as a crochet person and I made a yellow baby blanket that would look similar if put next to this! I am located in Iowa and I appreciate seeing the neat Knitting festivals and fairs. We don’t have anything like that close by. Oh I love giveaways! For me there are lots of exciting knitting moments when your brain goes “eureka”: matching the perfect pattern to stash yarn; or mastering a new technique. But today I finally put to paper a design that’s been percolating in my brain–and I’m so stoked to get started! Even working the swatch isn’t enough. I’m just so excited to get started! Its all I can think about. I am very new at knitting and learning the ropes very fast. I meet a wonderful group of women every week and I like that knitting is what brings us all together though we may be very different in terms of age, temperament or even nationality. A kit like this could add to my list of ‘new things to learn’ in knitting! I love the fiber, the creativity, being able to make something that no one else has – I love to be able to give handmade gifts. I would like to be part of a larger group of knitters and although the internet has helped in that regard, I would so like to be able to attend something like the Knitters’ Fair – it looked like so much fun. I am a very project oriented knitter. I just love being able to wear my own pieces and knitting things that look store bought (or better!). I get really excited after I’ve struggled through a piece that had a new stitch or a difficult construction method and finally get to show off all my hard work! I also really love learning new knitting techniques. I’ve been knitting for about 8 years now and I don’t think I’ll ever stop! I love being able to pick my own colours for sweaters when I knit. I love making something that I know few other will have made (maybe the February Lady Sweater aside:D). I love the people I have met through knitting. But most of all, I love making things, and this gives me a great outlet to do just that!! So fumes, friends and all the fabulous things you can create with some sticks and string! I saw you there, but held off on my stalking tendencies and left you to shop in peace. I may, however, be unable to show the same restraint if I see you at Rhinebeck. I’M SO EXCITED!!! Oh, and please pick my name to win the lovely yarn. Thanl-you. The exciting thing about knitting is that there are an infinite number of things you can make and it all originates from one long piece of string. I enjoy the diversity of knitting. Give two knitters similar yarns and patterns, and the product may look alike or it may not. Every knitter is an individual, and the articles they knit are too. Gotta love that! I find there is something cathartic in knitting. It brings about a spiritual renewal for me. Knitting is like cooking outside with an open flame under the stars, it’s primal. I’m making little knots in a row that end with a beautiful garment. If feel in touch with my ancestors who knitted and taught me to knit. Carrying forward a tradition that is simplicity at it’s best in this day and age of technology and machinery. It’s a passion that I’m happy to say is an addiction as well. What excites me most about knitting … is that I can take some easily acquired, easily transportable materials and create a beautiful one of a kind gift. I get as much, if not more, back from the whole process ( choosing … acquiring … processing ) as the recipient gets from the gift. Something very pleasurable can become very precious. That’s exciting. What excites me? The fact that I can take some yarn and some needles and create something beautiful. I am a creative person and my creativity used to be limited to crochet, scrapbooking and cooking. When I finally decided to pick up some needles and teach myself to knit, I didn’t know what I was in for; however, I am so glad I did. I enjoy knitting, it’s my destresser while sitting in stalled traffic, the drive up at a fast food joint and at work, when things are stressfull. I just love it! What I love most about knitting is the yarn — all the different colors and textures that I can work with! I love to knit because it helps the stress of everyday life and puts you to ease and the day gets better and you have a lovely piece to show in the end! ! From picking a pattern to searching for the right shade of yarn to casting on to completion, I’m excited about it all! However, the most exciting thing for me is getting other people excited about knitting! What a great giveaway, fingers crossed! What I a beautiful shawl! The KW fair was amazing. What I love about knitting – the creativity, so many endless options and how relaxing it is. The most exciting thing to me is that I can create something wearable from a skein of yarn & a pair of needles. It’s like magic. And 90% of the time, it’s so relaxing. (I won’t talk about the other 10%). Thanks for the opportunity to win a prize. The first thing that I thought of was that the same piece of string can become anything from a simple garter stitch to a complex lace and still be as beautiful. I love to learn new techniques. No matter how much you know, there’s always something new. It’s relaxing, creative, and fun! I love the finished project but I think I really like the planning. Picking out a pattern, then finding the perfect yarn, the end result is great but then I get to start the planning again. That must be why I have about 4 things on the needles at any time. I am always on Ravelry planning what is next. My favorite thing about knitting is the expression on someones face when I give them something fabulous that I’ve made. I usually don’t make anything for myself, but I love to make things for family and friends that I know will cherish them. Well, besides the initial fondling and purchasing of the yarn, I’d have to say casting on for a new project excites me the most. So many possibilities, all those lovely wound cakes to look at and watch turn into something new. Also, I’m afflicted with “startitis”, . I’m excited by figuring out new techniques. I also get particularly excited when I can “read” my knitting and instead of pulling back full rows, just drop a few stitches and fix the mistake that much quicker. There’s a lot that I love about knitting, but right now, I am really enjoying how it is bringing me together with a group of friends on a regular basis to knit, talk, and enjoy each other’s company. Am totally digging the fact that my dear friend taught me to knit last year for my 50th birthday. I am learning so much. What I love, and find most exciting, about knitting is that from a ball of string, using two sticks, I can create something wearable, desirable, and altogether wonderful. It’s amazing! I am a brand new knitter and am enjoying every aspect of learning. The yarns, the needles, the patterns…….oh so fun! I love the way the yarn feels in my hands.My days not complete without a little knitting!! What excites me most? That’s tough. I love yarn (like enough to consider willing my worldly possesions to my stash love), I love how knitting can be both incredibly difficult and meditative. But I think what really gets me going is how clever knitting can be. The first time I turned a heel I KNEW given enough time I could figure out how to do anything with sticks and string. What a like most about knitting is the fact that after a long hard day at the office, I get to sit down, pick up some needles and knit. The clicking of the needles calms me down and sooths my soul. Woah–what a really cool pattern! What excites me most about knitting is found in this project: something new that I haven’t encountered before makes me very eager to try it! Ahhh, man. I never win these things. But that shawl thingie has me intrigued…. What excites me the most about knitting? The casting on. No, wait, the casting off. No, umm, the challenge of a new technique. Or is it the choosing/pairing of pattern and yarn? Oh, I know, the giving of a gift. No, wearing something myself. Oh man, this is a tough question. Okay, this is it, the endless possibilities that come from a single skein and a pair of sticks in a rainbow of colours. Yup. That’s what excites me! I love that there is always more to learn. I am always feeling stretched, with st st to fall back on when I am tired. There are so many things that excite me about knitting but right this second it is being able to make cute things for my new niece! There are few things in life cuter than baby knits in my opinion. It is beautiful! Knitting brings peacefulness and a feeling of accomplishment. How can something so challenging also be so soothing? Then you add the wonderful yarns to choose and you have a great hobby. What excites me about knitting is the fact I can redo mistakes and it doesn’t involve buying more fabric or supplies. It just means I have to rip out the bad and reknit the good. Which is what I am in the process of doing on my Annis shawl. 50% of it ripped back!!! Oh well, good thing I enjoy the yarn and the knitting. Wish I could have gotten to the fiber fest. Did you see a gentleman walking around with his phone to his ear saying “yes, dear.”? That was my friend’s husband. She couldn’t attend so he was trying to find her some yarn. What a keeper! I love the transformation from a length of yarn to an actual garment. Also when people come up and want to know what you’re knitting, had a wee girl about 4 years old do this today, she wanted to know “everything”! The texture of that shawl is amazing. What I like most about knitting is that it’s such a tactile craft….the feel of the yarn going through your fingers, the different drapes and types of fabrics you get with different fiber content and its associated properties, the many different textural stitches you can create….yum! I love how much math is involved in knitting. The gauge, cast on numbers and the increases and decreases transform the yarn into a beautiful FO. Also the seamless sock construction – that is genius! what excites me most about knitting is that it is always a challenge … i have been knitting for years and I am always learning something new. I love the feel of the needles in my hands and the passing of yarn through my fingers. I’ve been knitting for 45 years and I never get tired of it! I love that new project thrill. The gathering of pattern, needles, and supplies. Putting it all together in a project bag, and then finally starting. I get a little thrill every time. My favourite thing about knitting is being able to say: ‘Why yes, in fact I DID make this myself’ … !! My absolute favorite thing about knitting is seeing something come to fruition bit by bit, inch by inch. It starts out just sticks and string and then before you know it you have an inch of something and after that you have something that sort of looks like it might become a sweater, or socks or scarf or hat, or shawl. And then you’re finished and it looks awesome and you want to shout “Look what I did” to everyone you know. And then you wash and block it and it’s even better! Love, Love, Love knitting! It is relaxing and rewarding and makes me happy to see wonderful, colorful, soft, sproingy, delicate, warm, etc. yarn on my needles. I love my LYSs (I’m lucky enough to have 3 in my area) and sometimes I go in just to touch the yarn. The most exciting thing about knitting is definitely creating a silhouette that can’t be found off the rack. hooray for original constructions! What excites me about knitting is the fact that I have created something with sticks and string (well, not really but I’m sure you get my drift!) Each project is different and I love the variety of things I can make with lots of different yarn and colours. I am also constantly amazed at how many things I still have to learn too! I too love that a pile of string can turn into something amazing just by knotting it around and around with a couple of sticks. I love the act of creating something useful and beautiful. What I like about knitting is the calm it brings me. Learning to knit was very stressful and I gave up a couple of times before actually deciding to stick with it. I’m so glad I went back to it. Knitting is the calm in my crazy life of juggling full plates. PS – what a unique and exciting pattern. I love it! I am a self taught knitter. I find that knitting calms me and it also helps relieve the arthritis pain in my hands. What excites me the most about knitting is what you can do with just two stitches. Knitting has gotten me through some rough times. What excites me the most about knitting, is that I can make an entire garment/ hat/whatever out of a (presumably) single piece of yarn! LOVE the capelet! What excites me about knitting… boy, this could turn into it’s own blog. The yarns & how they feel, smell, their colors, their hugability… Creating something gorgeous out of something as simple as string. The fact that you can knit with just about anything pliable. Even toilet paper! (It’s been done. Don’t ask, lol) The possibilities when presented with a couple of sticks and a piece of string. But what probably excites me the most is knitting’s calming effect. It’s SO much better than Vallium. What excites me about knitting is…everything! I love the feel of a new skein of yarn, casting on for a new project, binding off a finished object and all points in between. Even making mistakes is exciting, in a weird, challenging way; I love the sense of accomplishment I get when I figure out what went wrong and then get it fixed. And the feel of the knitted fabric that I created…superb! I love the decision making process. I never knit anything with the yarn the pattern calls for, so it’s always interesting to see how the FO comes out as an interplay of yarn (sometimes at a completely different weight) and design. Over the years, knitting has kept me sane..a skein on yarn is cheaper than a therapist!!!! ooooo, my friend and I spent a fair anmount of time at Vanderrock, oohing and aahing over her patterns and kits. I adore her attention to detail and the colours are fantastic. Gorgeous shawl! I think that’s what excites me most about knitting: beautiful shawls. I have way more than a person needs but it doesn’t stop me from casting on one more. 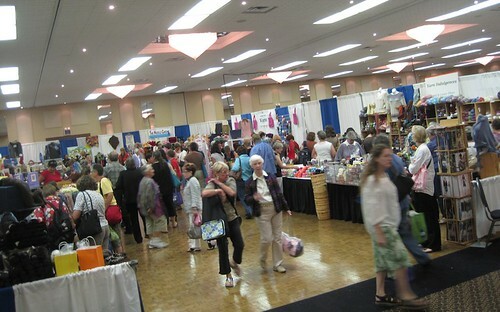 One of these days I have to get to the KW Knitters Fair. I live in TO. There is no excuse. I totally love the fact that knitting is always interesting! New patterns, new yarns, new needles, and always more fun! Thanks for the opportunity. The thing I love most about knitting is how much it relaxes me and it thrills me to see things “become.” This pattern would be perfect to wear with the dress I have for my daughter’s wedding! What I love most about knitting is watching my 10 year old daughter whip out amazing things. I have no skill so I think she is incredible. I love that knitting can do so many different things–it can be soothing, it can be challenging, it can make me patient or impatient, but it always ends with something lovely. I love love love the sense of creating something from nothing. I’d be lost without the comfort I get from having needles/hooks in my fingers, and I love sharing accomplishments with others who appreciate the time and effort you put into it! I love that knitting brings together creativity, ingenuity, craft and community. It connects me to my past (my grandmother taught me), and to this big and wonderful present and future. What excites me most about knitting is that I FINALLY have been able to create something for my mother, who made all my clothes and took such good care of me as a child. I love being able to give back to her something so personal. I love the meditative qualities of knitting- and seeing how the colors of a skein knit up to create something altogether new and beautiful! What excites me the most about knitting is how calming it is, now. Wasn’t when I was learning, but with a little experience, it is the most calming thing I can do when I am upset, anxious, worried, etc. Colorwork to me is the best that knitting can bring to my life. I love how the colors unfold into a very beautiful design! What a beautiful pattern! I’m equally excited by starting and finishing a project, although each finished project comes with a bit of sadness too … is the relationship with that project really over?? The other thing that really excites me about knitting is teaching my 11-year-old, and having her be so excited by it. Take a craft and pass it down! I love that shawl! I love to knit because it is a way to share with others, whether it is knitting for charity, knitting gifts for family and friends or teaching knitting to others so that they can have this same awesome experience that I do every time I pick up my needles. It is also a great outlet for my obsessive compulsion to buy yarn. It’s so hard to pick just one thing that excites me about knitting. I think (this week, at least) I’ll pick The Possibilities. Yes, it needs to be capitalized. Unlike just buying a knit item, you have the opportunity to explore all the possibilites of that item. Any colour, size, shape, embellishment you can visuallize becomes a Possibility. You are not tied to what is available to buy in a store, but have an entire world to explore, one that you can make as large or small as YOU desire. What excites me about knitting? Too many things to list. I love beng productive with my time. I love discovering new yarns. I adore leafing through pattern books and magazines even though I’d need to live three lifetimes to come even close to knitting all the patterns I’ve earmarked! wow, looks like feathers or angels wings or something like that. Wonder if it will fly my way since i totally missed out on getting to the show. I’m totally excited about the people and friends I’ve made knitting. Knitters are such a kind and giving group of people. The yarn gets me going also. What excites me most about knitting is the incubating stage (before the actual creation of the project), when I see a yarn or a pattern that intrigues me, and then choose materials, makinbg certain I have the right needles, filled with promise and anticipation before I actually cast on. Equal to this process, however, is the actual time knitting–the almost meditative process where I force my mind to focus on the task at hand, or else completely botch a row or project if my mind wanders to the cares of the day. I had a great time at the Fair too! I had a lovely chat with Stephanie and was admiring her capelet. What excites me about knitting? Too many things to pick just one but lots of new yarns always get me rev’d up, thinking about all the wonderful things I could create. The feel of the yarns excites me! And I love when I have a new project to start! Pink is perfect – thanks for the giveaway! I find the most exciting thing about knitting is.. I have a hobby where I can create sweaters for my whole family. I get excited when I see a great knit somewhere and realize “I could do that.” or when I realise “I don’t know how to do that, but I bet I could figure it out”. Take that gorgeous shawl for example. I don’t know how to do that, but I bet I could figure it out – if I win the pattern, that is. Amazing shawl… would love to make it.. and pink! Love it! What I love about knitting is that you can take beautiful yarn and make it into something that you can wear or carry or display. No one would think it weird for you to be wearing a shawl, but some non-knitters might think it odd if you just carried around the skeins of yarn to constantly admire and show off. At least knitting them up into something pretty distances you from the “weird” side… Ha ha!! What excites me most about knitting – yummy yarn, new patterns, new things to learn. Thank you for this give away – pattern is beautiful and it would be great to try a new yarn. What a gorgeous knit – I would love to win it!! What excites me most about knitting is the immense scope for the imagination. I can learn a new technique or stitch or discover a new fiber or colorway every day for the rest of my life if I want to. I can find knitting to fit every mood. Whatever I need – comfort, inspiration, distraction, challenge, joy, patience – is just two needles away. And while I’m meeting those needs, I’m producing something both beautiful and useful, tangible love to wrap around my family, my friends and my self. How totally and utterly fantastic! What I love most about knitting is that it never gets boring. There are always new stitches, patterns, needles, and yarn to use. The combination of all of them means that you get a new experience everytime you cast on. Oooh, I love a little giveaway. I could use some new inspiration. . . I love the pattern! Pink, well . . . Anyway, the thing I love most about knitting is that it can be as simple or as complicated as you want. How interesting! I’d certainly love a chance to give that a go!! Everything about knitting is exciting. From cast on to bind off, from the shop or internet site to my hand, from the book, magazine or internet to my chart holder … the only part that isn’t great is tinking five or more rows. Up to five it’s a lesson in caution. After five, it’s a lesson in humility. Love the shawl. Love to win the yarn and pattern for it. I looked for myself in the pics from KW Fair. I also did some stash building – and i don’t believe in stashes! I just started knitting about a month ago, but I like to live dangerous and test myself! My favorite thing about knitting is that I can do it while watching TV or listening to an audio book. I tend to become obsessed and then bored with hobbies easily, so having something to casually occupy my mind during the slower periods is wonderful! 2 sticks + 1 string = something wonderful. Knitting is magic!!! What a great giveaway!!! Just what every knitter needs–a new project! What I love about knitting? My mother taught me when I was small. It was something we shared as I grew older. Now that she’s gone, it still makes me remember the happy times with her. What I like about knitting is that allows me to unwind and relax without going totally mind-numb. And sometimes it’s actually a challenging thinking exercise, yet still feels like unwinding from everything else. Very simply knitting has given me a creative outlet (which until that moment was missing), and the opportunity to establish new friendships/relationships. Knitting has also brought me closer to the ppl. in my life, I never though that a pair of baby booties could mean so much to a person. That is so very cool, I just love the caplet. 🙂 I am not sure which I like about knitting the most. Learning something new, sharing in a tradition that countless others have done before me, or imagining the possibilities. I think what I love the most are the wonderful friendships I have made while because of knitting. What I love best about knitting is the conversation starters you have when people see you knitting. Beautiful! I would love to try and knit this! Oh, and what excites me most about knitting is seeing something beautiful form from just yarn and needles. And how relaxed it makes me after a full day with my active 5 year old! I get excited about beautiful sock yarn. You can never really have too much, IMHO. Thanks for the giveaway, the shawl is pretty amazing. I like best that you can knit even when you can’t run! Everything everyone else has already said sounds good. I think, though, that the most exciting thing about knitting in my mind is that you are constantly learning. Beyond learning new techniques, like different cast-ons, or how to cable without a cable needle – each new pattern is a new way to manipulate stitches to create a shaped piece of fabric. Each knitted item has a “so THAT’S what that does” moment to it – at least one. Those a-ha moments are, I think, my biggest knitting rush. I hope that I’m in time! I love the calming, destressing about knitting. I also love the gratification that comes from being able to create while I watch movies and the food channel. What excites me most about knitting? I can learn, create, be challenged, learn to forgive myself for making mistakes all at the same time. No other form of needlecraft gives that. That I learned how to do it in the first place! I can crochet myself into a circle but knitting was a challenge. I just love a challenge! I love that knitting is like yoga for my brain. It puts me all back together again, time after time. Knitting is a daily form of meditation for me. There is little else that gives me the same satisfaction as learning a new knitting skill or attempting a pattern stitch I’ve never done before (and even after 40+ years of knitting, I’m still learning!) I find the process itself even more enjoyable than the finished product. When they make that leap from being a beginner, and resigning themselves to that fate and then, BAM! suddenly they find themselves knitting in the round and doing CABLES. Reminds me of my first breakthrough. It’s such a marvelous feeling, and I can’t help but to get really excited for them! I love that knitting can give me whatever I need at the moment. If I need a challenge, I grab the lace project. If I need a quiet break, the garter stitch hat. Something portable, socks.